So please, don’t try to do this without proper training, planning, equipment, etc. but feel free to ask me any question about the trip. 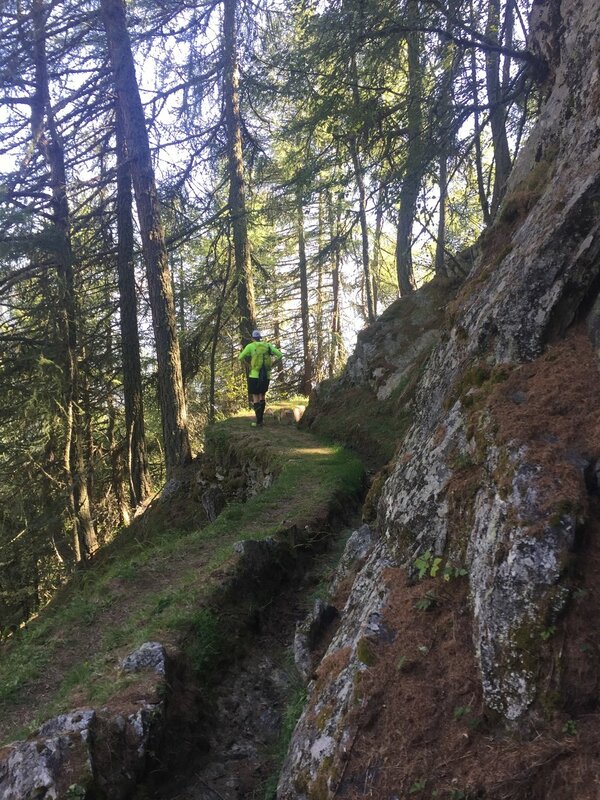 For many years I wanted to run somewhere in the Alps, run down from the top of the mountains and enjoy the breathtaking views in the summer over the summits and valleys. One race, the Transalpine Run, was always on top of my mind. It’s a 7 day ultra-run across the alps, usually ca. 250km long and you can only run as couples. In 2015, I actually registered and teamed up with Felix but couldn’t even go to the starting line thanks to my knee which was injured. That was a bummer. So here we go again in 2017. 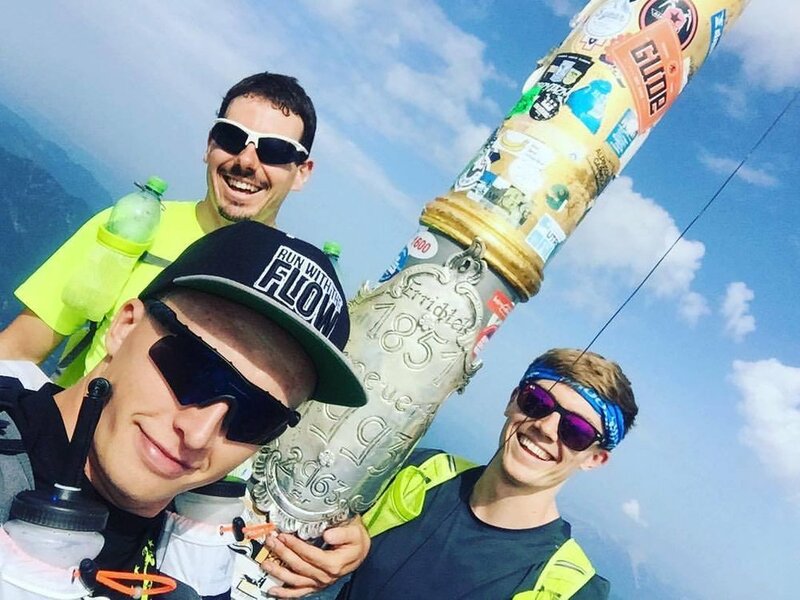 I followed another running mate in 2016 when he crossed the Alps from Garmisch-Partenkirchen to Lago Di Garda on his own and was impressed by his achievement and the pictures he posted. So why not doing the same route with some friends I thought? Somehow we - Lucas, Fabi and myself - could turn this plan into reality, got the GPS track and booked the hotels in advance for the 8 day running trip of ca. 331km and 23k of altitude. The weather in the Alps is very different and even though I knew that I still underestimated it a few times. It can change so fast – you cannot even change your clothes when it suddenly starts raining. And boy, do I love functional clothes. Hard to imagine how people survived on top of mountains without them. On some days we put our windbreaker on and off every 20-30min. Day 1 [12h, ca. 50km, ca. 5000hm]: Garmisch – Höllentalklamm – Zugspitze – Direction Ehrwald – Seebensee – Coburger Hütte – Drachensee – Grünsteinscharte – Obsteig. We got up at 5.45 somewhere in the middle of Bavaria, quickly ate something before we took the train to Garmisch where we arrived at 9.00. Since Fabi forgot to bring his climbing harness, I had to buy one and we finally could start at 10.00 which is quite late for what was ahead of us: more than 50k and 5000m of elevation. We didn’t have in mind that on a Saturday in August, the Zugspitze is usually very crowded. With fresh legs, we went up through the Höllenklammtal and made our way to the top until the glacier. There, we realized the recent articles about Alpine tourism are actually true. We had to wait for 1h on the glacier before continuing on the Via Ferrata (Klettersteig) up to the top of the Zugspitze. On the top, there was no time for food, we quickly drank a non-alcoholic beer and tried to speed up on the way down. Unfortunately, we missed the right turn and went down on the wrong side of the mountain. Hm. What to do next? At 6.00pm we saw a storm coming up and the huge mountain in front of us that we still needed to cross. Without any alternative, we continued the new path and the sun went slowly but steadily down. The atmosphere was incredible though: the red sunlight shined on the top of the mountains, the moon and some stars were already up in the sky, people were drinking beers near the lake where we passed by … and we had to go up this hilly mountain even though we would have loved to stay at this lake. Once we arrived on top of it, it was already dark and we had to use our head lights and called our hotel that we won’t make it before 10-11pm and that we are extremely hungry. At ca. 11.30pm we were at the hotel - what a start! Day 2 [11h, ca. 30km, ca. 4000hm]: Taxegg – Sautens – Karalpe – Mittlerer / Hoher Karkopf – Äußerhoher Kogel – Erlanger Hütte – Wildgrath – Hoher Gemeindekopf – Ludwigsburger Hütte – Mandarfen (Pitztal). After a relatively short night and a long breakfast, we quickly went down to Sautens. From there it was a long and very steep way uphill to the first summit. At least some blueberries made the ascent easier but when we nearly reached the top there were suddenly no signs anymore. We stood in front of an extremely steep stone desert and our GPS told us to cross it. Well, with no other chance we went up and then down again to the Erlanger Hütte where we stopped for lunch. After some carbs, we went up to the Hoher Gemeindekopf followed by light rain. However, when we reached the top the sun came out, the rain stopped and a rainbow appeared. We had to run up one more summit before there was a long downhill. Unfortunately, I twisted my ankle. Not totally bad - but it hurt so we had to go slowly. Half an hour later we took the wrong way, ended up in the forest and had to go down while it got really dark. And then I even managed to break one of my sticks. Well, the first two days are intense I thought. One hour later, it reminded me of the day before. It’s completely dark, we’re partially injured, more than 11h of hiking and we are still quite far away from our hotel. So we had to take a taxi to the town and to get something to eat before the restaurant closes. Day 3 [10.5h, ca. 40km, ca. 2850hm]: Mandarfen – Braunschweiger Hütte – Pitztaler Jöchl – Tiefenbach – Panoramaweg Vent – Bella Vista – Kurzras. After some pasta in Vent, we started our way to Kurzras. Slowly and unsurprisingly our legs got very tired so we slowed down - it was more a mix of running and walking now. While the route to Bella Vista was really beautiful because we passed many small glaciers, it really took some time. But after 3h we arrived at the mountain cabin and went down the last kilometers to Kurzras. Day 4 [6h, ca. 23km, ca. 1400hm]: Kurzras – Jöchl – Schwarze Lacke – Schlanders Alm – Schlanders. Finally, an “easy” day. The hardest part was the ascent to the only summit of the day at the beginning. The weather was beautiful, the sun was shining and the atmosphere was good. On the way down to Schlanders, we passed some mountain lakes and jumped into one of the cold lakes. The trail to the valley was steep but not too steep so really good for a fast technical downhill run. We passed by some cows and arrived at the Schlanders Alm where we got homemade cheese, bread, and sausages. We continued the way down and arrived in Schlanders in the afternoon. This was the first time that we finally had some hours to relax. We used the time to go to the sauna, pool, and spa – that felt really good. Day 5 [10h ca. 37km, ca. 2800hm]: Schlanders – Marteller Höhenweg – Zufrittsee – Zufallhütte. Day 6 [8h, ca. 37km, ca. 1500hm]: Zufallhütte – Fürkeleferner – Fürkelscharte – Ossana. We started our day after the breakfast from the Zufallhütte to Fürkeleferner which is a long glacier tongue. Seeing the whole glacier in front of us was breathtaking. And it got even more interesting when we had to think how to climb up the glacier. It took us a bit longer than expected because it was – unsurprisingly – very slippery. But after 2h we were on top of it and started the way down to Ossana. The whole way was a fun and partially technical downhill which everybody enjoyed a lot after the slippery uphill battle. And in the end, we had some hours to rest in the evening which was nice. Day 7 [12h, ca. 64km, ca. 2800hm]: Ossana – Passo-Scarpaco – Carisolo – Preore. After a very nice breakfast in our Airbnb, we got ready for our way to Preore. When we started, we had something like 50k in our mind – that it will be 64km in the end was a bit surprising. The heavy rain was also a bit surprising but what should we do?! So as always, up to the next summit in the forest where the rain wasn’t as heavy. However, after 30min we were already completely wet. Further up and across a stone dessert the rain got stronger, the wind was blowing more powerful, the stones were slippery and we didn’t see any other people for the last 3h. But we were nearly on top so we continued to climb up and tried to go down as fast as possible. Again and again, the wind got stronger and we got really cold on the way down to a little mountain lake. Luckily there was a small mountain cabin which was open so we went in. Inside there was nobody but we could at least change our clothes and eat something. We then continued our way to Carisolo with a few ups and downs. From Carisolo to Preore it was 35km. We couldn’t believe our eyes when we read this for the first time and honestly, we got very demotivated. Cookies help always and this was also true in this case so we somehow managed to motivate ourselves and continued running. It was a veeeeery long way but mostly flat so the kilometers went down rather quickly and around 9.30pm we arrived at our hotel and got a big dinner. Day 8 [10, ca. 50km, ca. 2400hm]: Preore – 5 summits – Riva del Garda. Even though the day before was really exhausting we were pumped for the last day. Between us and Lago di Garda were 5 summits we had to pass. It was raining a little bit but not too much and we hiked up the first summit. On top of the summit, the rain slowly turned into snow. Over time, the snow and the wind got stronger. And boy, we were starting to freeze. We tried to run as fast as possible to keep the body warm but the wind and snow made it really hard. When we found a small cave, we got inside and changed our clothes. Still, it was hard to get warm even though we continued running. After more than an hour, we found a mountain cabin with an oven, tea, and Spaghetti aglio e olio. We got warm and started the last part of our trip – a 3h decent from the mountain down to Riva del Garda. Before this adventure, I always had this idea in mind of going down to Lago di Garda in the afternoon when the sun shines and the lake shimmers ... and now we didn’t even see the lake due to the fog and rain. This didn’t stop us though and we went down the Via Ferrata until we arrived – totally wet but happy – in Riva del Garda. Ca. 331km and 23km of altitude behind us and some more days to relax at the lake in front of us. What a trip – and certainly not the last. It is really hard to put all those memories and views into words and pictures (next time we need a proper camera). We saw an incredible amount of different landscapes and experienced the mountain wilderness, ran and hiked for hours without seeing any people and had a lot of fun along the whole journey. And most importantly was not the finish line at Lago di Garda - but the journey itself.